This ideal investment would be something like a very (very) high interest bank account paying some “X”% plus inflation. In most 30-year periods the S&P 500 index (including dividends) has returned an average of 6% to 8% per year after inflation (although with very wide annual fluctuations around the average). At times the 30-year average has been below 6% (never below a 4.4% average per year over any 30 calendar year period in our data base which starts in 1926). At times the &P 500 has returned more than an average 8% per year, after inflation, over a 30 year period with the highest being 10.6%. Warren Buffett’s Berkshire Hathaway has returned about 20% per year over the past 48 years since Buffett took control. That’s about 17% per year after inflation. It therefore seems reasonable to suggest that an ideal investment might return more than 6% but not more than 15%. And, it’s probably not realistic to target more than 8% to 10% per year after inflation even for an ideal investment. Sadly, the ideal investment does not exist. But it may be useful to think about which, actually available investments might be the closest to this ideal. The two main investment categories are stocks and bonds. Bonds – 30-year government bonds are currently yielding about 3.4%. This is before inflation. High quality corporate bonds currently yield no more than 5.0%, before deducting inflation. It therefore seems clear that an investment in government bonds cannot possibly even approach our ideal target of at least 6% per year after inflation as a long-term average. Bonds can be good investments at times. That time does not appear to be now. Stocks – When it comes to stocks we need to remember that stocks are ownership shares of corporations. In the long term the average return from owning stocks is limited by the earnings returns of the corporations that trade on the market. Many corporations on the market are earning 10% or higher returns on equities. This is before inflation. Logically, and mathematically, if a corporation continues to earn 10% or 14%, as the case may be, then long-term investors are ultimately going to benefit from those returns. Unfortunately companies that are earning 10% and higher ROEs and are expected to continue to do so can rarely if ever be purchased in the stock market without paying perhaps two to three times book value. This can lower the return to an investor. Still, if an investor can later sell at the same multiple to book value then his return (except for dividends) is unaffected by paying a multiple of book value. And, if an investor holds for a very long time then the investors percentage return will not be greatly affected even if the multiple falls. Stocks (the S&P 500) have historically usually achieved after-inflation long-term average returns of 6% or higher. And there are logical reasons to think that they may continue to do so given that they are oven earning in excess of 10% returns on their book equity. And they are, on average, retaining a good portion of their earnings and have historically been able to earn 10% ROEs on the retained amounts as well. Actually, at last check the average Return on Equity of the companies in the Dow Jones Industrial average was almost 18%. I would expect ROEs to trend down. But it does not seem unreasonable to assume that ROEs will remain above 10%. A company with a long-term ROE of 10% and which has a dividend pay-out ratio of 50% and which trades at twice book value would provide long-term average annual returns of 7.5%, before deducting inflation) to investors if those conditions continued. This possibly gets us to the minimum return of 6% from an ideal investment. And if the companies can continue to earn higher than 10% ROEs, as they currently are, then our expected return would increase. And if we can select better than average stocks (admittedly no easy task) then we can expect even better returns. It is well known that higher return investments such as stocks and even longer-term bonds expose investors to large fluctuations in the market value of their portfolio. So stocks at least offer the possibility of achieving the returns, although not the stability of our ideal investment. If your situation is such that failure to preserve your capital could leave you freezing and starving in the dark at some future point then you may have no choice but to accept the low returns of the very safest investments. You will therefore, sadly, have no chance of getting ideal-investment-like returns. If, on the other hand you are not ever going to be reliant on your investments to cover your most basic living needs then your goal may be to become rich through investing. If this is the case you will have to accept a good deal of volatility in your portfolio in order to reap the higher returns that are expected (but not guaranteed) from stock investments. If you hope to make 6 or 8% or more after inflation, it makes sense to “fish where the fish are” You would need to invest in entities that are earning those kind of returns. Investing in things that earn 5% or less (before deducting inflation) is not likely to help you attain your goal. None of this is meant to imply that stocks will make good returns, or even beat inflation, over any particular shorter period of time (like 10 years or less). Stocks, and especially U.S. stocks, have provided investors with outstanding returns in the past few years. The S&P 500 is up 23.4% in 2013. Including dividends, that is a return of about 25%. Obviously stocks cannot and will not return 25% every year. After this recent gain of 25% it is very possible, perhaps even likely that stocks will decline or at best return very little in the next year. Stocks however are not at the kind of extreme valuations where investors would be wise to avoid investing in stocks. My strategy, which I do not suggest is suitable for others, is to place 60 to 70% of my funds in equities and the remainder in cash. I am not holding cash primarily to cushion my portfolio from volatility (although that is part of the reason I hold cash). I can live with considerable volatility. I am holding cash primarily in order take advantage of volatility (lower prices) whenever it occurs. If you are lucky enough to have amassed a fairly large RRSP account you may be wondering how to avoid income taxes on withdrawals. My rather harsh conclusion on this is that the tax usually cannot be avoided and and also that we don’t deserve to avoid it. Those who are greatly disturbed by paying high income taxes on RRSP withdrawals may need to be reminded that “their” RRSP was effectively subsidized by an income tax refund at the time the money was contributed to the RRSP. Mathematically, $10,000 originally invested in an RRSP cost the investor only $6000 assuming a $4000 tax refund, which applied if the contributor’s marginal income tax rate was 40%. If the $10,000 in the RRSP later grows to $100,000 and if $40,000 is paid in taxes, this can be thought of as giving the government back “its” 40% of “your” RRSP while you net $60,000 which is precisely equivalent to your cost of $6000 grown completely tax-free to $60,000. The “deal” was we got an initial tax break and then years of tax-free compounding but then we pay tax on withdrawals. No one was forced to contribute to an RRSP. In any case whether the income tax is fair or not, it is is not likely that it can be avoided. I am by no means an income tax expert and so the following is not meant to be exact but does give a reasonable idea of the income tax rates paid on RRSP withdrawals. Consider the marginal Income tax rates in Ontario. If you are lucky enough to have $500,000 in an RRSP, here is how things might look if you begin withdrawing at age 65. In this case the tax rate on the entire $25,000 RRSP withdrawal appears to be 20.05% or $5,012. This hardly seems at all unfair given that the original income tax refund rate was probably at least that high and quite possibly double that. The only way to avoid the 20% tax here would be to have year where you only make $12,822 and so the basic and pension deduction shelters all your income. So, for example, one could quit working a year early at 64 and could pull a whole $12,822 out of the RRSP and avoid the 20% tax or $2,564. Quitting work a year early simply to avoid a rather measly $2,564 in tax would not seem too wise. Let’s look at another scenario where we also have $50,000 in pension income and so are in a higher tax bracket. The total income tax on the $25,000 RRSP withdrawal is $11,775 or 47%. In this case with the average tax on the RRSP being about 47%, it is certainly worth thinking about how to avoid it. The biggest reason to try to avoid the tax is the extra 15% “tax” due to the old age claw back. But the old age pension only starts at age 65 and most pension income could not be deferred. It might be worth deferring the CPP which is a maximum of $12,150 and will increase if deferred. This could save 15% of that amount in taxes or $1822. It might be possible to withdraw a large portion of the RRSP before age 65. But that lowers the time for tax-free compounding. It could also mean giving up work earlier than planed. Those who retire well before age 65 may benefit from lower taxes on RRSP withdrawals since the claw back would not yet apply. But the available savings do not appear to be enough of a reason to retire early simply to avoid RRSP taxes. Retiring one year early saves little tax. Retiring ten years early could save a fair amount of tax by taking withdrawals before the old age pension applies, but retiring ten years early means foregoing significant income. Overall, there does not appear to be that much opportunity to avoid income taxes on RRSP withdrawals. However, if you consider that “your” RRSP was subsidized to the tune of 30 to 40% through tax refunds on RRSP contributions then a 30 to 40% tax rate on RRSP withdrawals does not seem unfair. And decades of tax-free compounding can mean that you are ahead of the game even with 50% tax rates. I have read about schemes to offset taxes on RRSP withdrawals by borrowing money to invest and deducting the interest paid. This requires that the invested money attract no near-term taxable return – such as by investing and holding non-dividend stocks. But at today’s low interest rates it would require the borrowing of massive amounts of money. Creating $25,000 in interest payments requires a $625,000 loan at 4% interest. Also it can be difficult to borrow on an interest-only basis. I don’t think it is a worthwhile strategy. Avoiding 40% tax on an RRSP by paying all of the RRSP withdrawal in interest payments, does not strike me as a winning idea. If one is lucky enough to have large RRSP income, one should probably just pay the tax and not engage in aggressive attempts to avoid it. Our Stock Picks in 2013 have performed beyond expectations. 2013 is shaping up to be one of our best years since our inception in 1999. 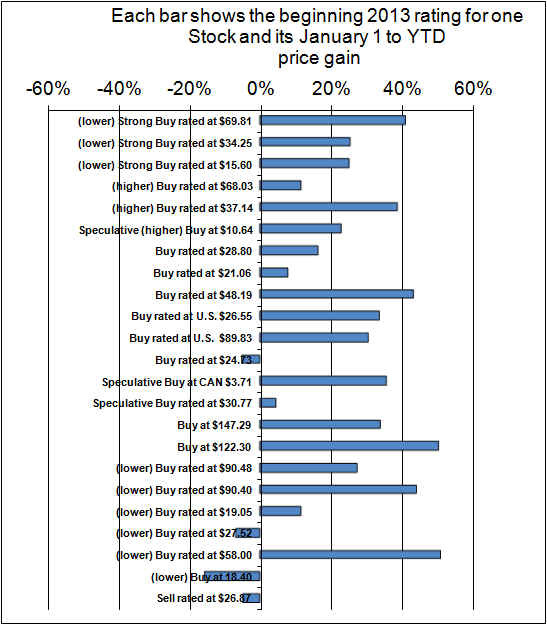 This chart shows the percentage gain or loss on each of the 23 stocks that we rated as Buy or Sell at the start of 2013. Since we mostly look for stocks that we think will rise, only one stock, the one at the bottom was rated Sell. 19 out of the 22 Buy rated stocks rose in price. 5 of the 22 have risen more than 40%. 14 of the 22 have risen at least 20%. Only 3 of the 22 fell in price and the largest decline was 16%. We would be the first to admit that the above chart looks too good to be true. It is our true performance for 2013. But we would not expect to do this well in an average year. But we have beaten the market by an average of 11% per year for the past fourteen years. We only trailed the market in two years, which was 2007 when we trailed by 8% and 2010 when we trailed by only 0.4%. We make absolutely no guarantees about our future performance. But if you agree that InvestorsFriend Inc. appears to provide good stock picks based on logical analysis then why not subscribe now? (Click the link at the top of this page for more information.) The cost is $15 per month or $150 per year. Many stock picking services charge double or triple this amount or even more.